A newly completed statistical study of the optical and infrared properties of 330,811 galaxies traces the evolution of galaxies that host massive black holes. Our Milky Way galaxy, like most galaxies, has a nucleus with a massive black hole. Our nuclear black hole contains about four million solar masses of material, but others are thought to have hundreds of millions of solar masses or even more. Around the core, according to theories, is a torus of dust and gas whose inner edge can be heated to millions of degrees by material falling into the black hole, a process called accretion. Accretion heating can sometimes drive bipolar jets of rapidly moving charged particles, which radiate at radio wavelengths and are detected as bright cosmic radio sources. 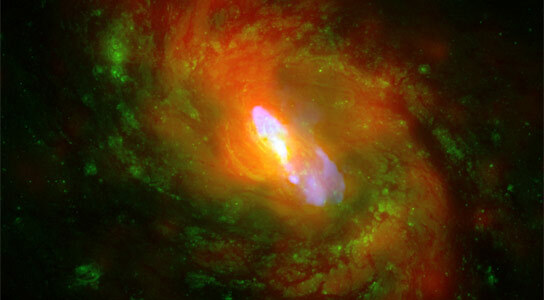 Galaxies frequently collide, and it has been predicted that such mergers tend to push material towards the central black holes, thus fueling the accretion process. There is a variety of evidence in favor of this scenario, including the fact that more massive black holes are found in more massive galaxies, possibly the results of mergers. However, there is some conflicting evidence. By some accounts there are not enough merging galaxies to account for all the massive black holes that are seen. Moreover, galaxies and their black holes can also grow and evolve by more mundane processes such as normal gas inflow to the cores. Finally, most galaxies from an epoch a few billion years ago appear to be relatively normal objects, and not undergoing collisions. A team of nine CfA astronomers and their colleagues have proposed a solution. Andy Goulding, Bill Forman, Christine Jones, Steve Murray, Alessandro Paggi, Matt Ashby, Jaisheng Huang, Ralph Kraft, and Steve Willner, with their team, have completed a statistical study of the optical and infrared properties of 330,811 galaxies covering distances out to about four billion light-years. They cross-reference the optical properties with infrared, X-ray and radio catalogs to determine which galaxies have radio loud outflows (they tend to be reddish in color) and which are dominated by star formation activity (these tend to be bluish). The astronomers explain the conflicting evidence by showing that there are probably two different accretion mechanisms at work. 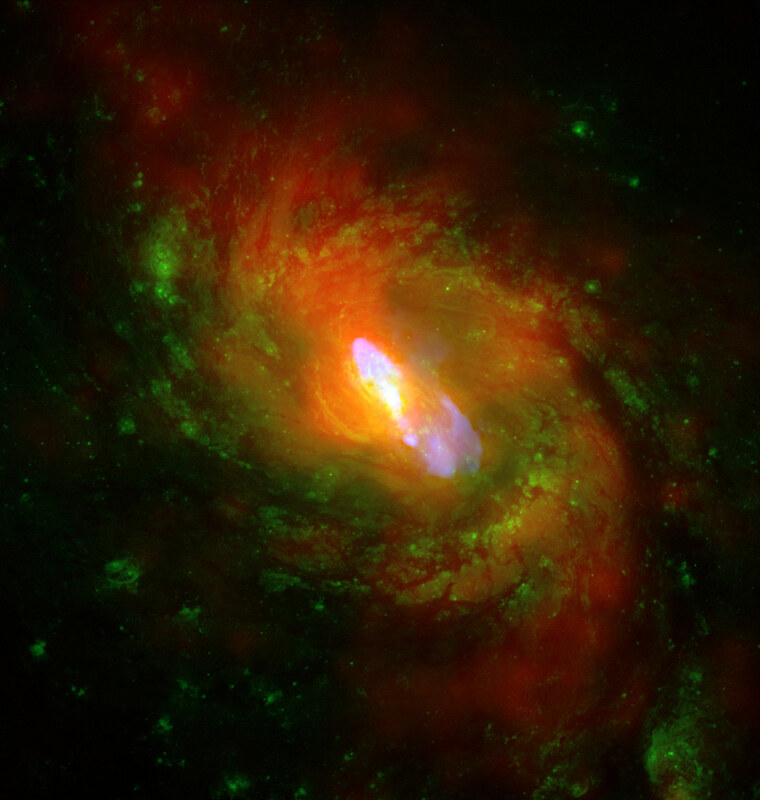 Bluer galaxies, which are predominately seen in optical, infrared or X-ray bands, have black hole accretion that is probably driven by active star formation in the disk of the galaxy. In the redder, radio-loud galaxies (which are also fewer in number), the black hole accretion is of a different type called advection-dominated; here there is so much inflowing gas that the radiation is trapped and cannot escape. These redder galaxies are probably characterized by having undergone catastrophic collisions. The team not only finds that galaxies group into these two general kinds of sources, they also report that, contrary to some conventional ideas, both kinds of galaxies evolve in much the same way as do their counterparts without active black holes. Be the first to comment on "Researchers Trace the Evolution of Galaxies that Host Massive Black Holes"